With so many discoveries over the years, science is literally changing our minds about the optimal care and feeding of the brain. All of it is captivating. A great deal of it is unexpected. In his New York Times best seller Brain Rules, Medina showed us how our brains really work—and why we ought to redesign our workplaces and schools to match. In Brain Rules for Baby, he gave parents the brain science they need to know to raise happy, smart, moral kids. 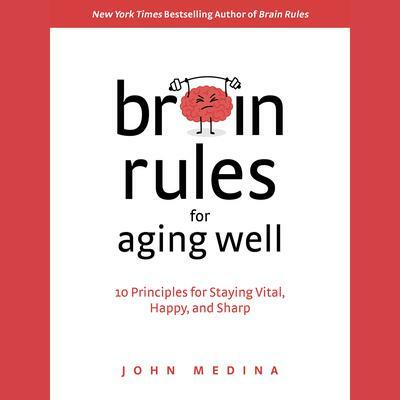 Now, in Brain Rules for Aging Well, Medina shares how you can make the most of the years you have left. In a book destined to be a classic on aging, Medina’s fascinating stories and infectious sense of humor breathe life into the science. Brain Rules for Aging Well is organized into four sections, each laying out familiar problems with surprising solutions. First up, the social brain, in which topics ranging from relationships to happiness and gullibility illustrate how our emotions change with age. The second section focuses on the thinking brain, explaining how working memory and executive function change with time. The third section is all about your body: how certain kinds of exercise, diets, and sleep can slow the decline of aging. Each section is sprinkled with practical advice—for example, the fascinating benefits of dancing—and the brain science behind each intervention. The final section is about the future. Your future. Medina connects all of the chapters into a plan for maintaining your brain health. You may already be experiencing the sometimes-unpleasant effects of the aging process. Or you may be deeply concerned about your loved ones who are. Either way, Brain Rules for Aging Well is for you. DR. JOHN J. MEDINA, a developmental molecular biologist, has a lifelong fascination with how the mind reacts to and organizes information. He is the author of the New York Times bestseller Brain Rules—a provocative book that takes on the way our schools and work environments are designed. He is also the author of Brain Rules for Baby, a must-read for parents and early-childhood educators. Medina is an affiliate Professor of Bioengineering at the University of Washington School of Medicine. He lives in Seattle, Washington.